Spend a morning or an afternoon discovering London Blue Plaques on a Chelsea walk. 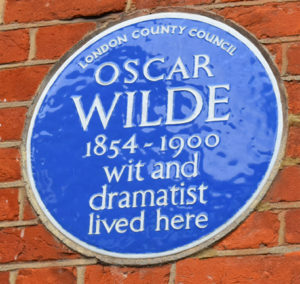 For more than 150 years, blue plaques on London’s buildings scattered around the city have marked the homes and achievements of the famous and infamous. 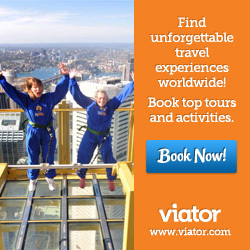 Join us on this free, self-guided tour. It’s a kind of massive “George Washington slept here” scheme, except you won’t find George Washington anywhere; though you might find Benjamin Franklin. Hundreds of others – writers, artists, performers, musicians, composers, teachers, politicians, inventors, explorers, philosophers, engineers, heroes and heroines are commemorated all over the city. 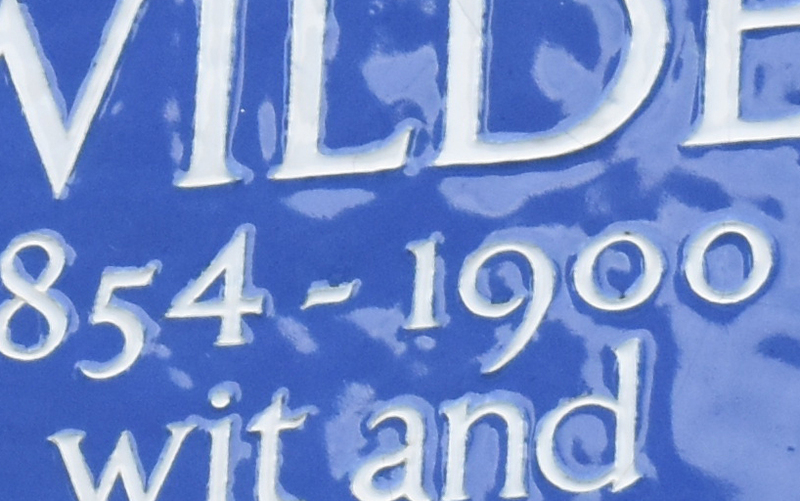 London has the oldest blue plaque scheme in Britain. The plaques surprise and educate passersby who come upon the discreet reminders of people from all over the world who lived and worked in London. I was inspired to find out more about the blue plaques by a plaque dedicated to an unknown (to me anyway) poet on a house across the street from my flat. 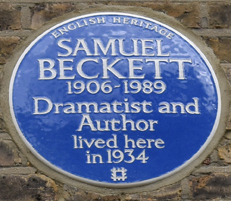 Today there are about 930 blue plaques in the London scheme administered by English Heritage. The first was put up in 1866 honoring Lord Byron. The oldest still existing commemorates a short stay by an exiled French king, Charles X. Up to 20 plaques a year can be added. In 2017, six went up to honor Francis Bacon, Charlie Chaplin, Sir John Gielgud, Rudolph Nureyev, early 20th century working women’s champion Mary Macarthur and volunteering pioneer Stella Lady Reading. So far, in 2018, new Blue Plaques have gone up, including three to leading figures in the Bauhaus movement who fled to London in the 1930s to escape the rise of Nazism – Walter Gropius, Marcel Breuer and Lazlo Moholy-Nagy. Also honored with a new plaque – British actor Peter Cushing, who rose to fame in Frankenstein and Dracula films but is probably best known to younger audiences these days as the Grand Moff Tarkin in the Star Wars films. And fans of Mary Poppins can check out the newest Blue Plaque in Chelsea, at 50 Smith Street, home of author PL Travers. She wrote her fourth book and negotiated film rights with Disney while living there. This walk will take you through Chelsea, north and south of the King’s Road. About two miles long, beginning and ending near King’s Road bus stops, the walk is flat and should take you less than two hours walking at a snail’s pace. To start, take the 11, 19 or 22 bus from Sloane Square Underground Station, up the King’s Road to Carlyle Square. It’s then a five minute stroll to Mallord Street where the walk begins. 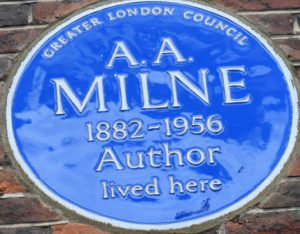 London Blue Plaque for Winnie the Pooh author A.A, Milne. 1. 13 Mallord Street in Chelsea is the house where both Christopher Robin and Winnie the Pooh were born. A.A. Milne moved there with his wife in 1919. His son, named Christopher Robin though called “Billy”, was born here and while living in the house, Milne wrote When We Were Very Young, Winnie the Pooh, Now We Are Six, and The House at Pooh Corner. Christopher Robin’s toys became Pooh, Piglet, Eeyore, Kanga, Roo, and Tigger. Few people realize that Winnie the Pooh himself was inspired by a real bear named Winnie after the city of Winnipeg in Canada. Canadian Army vet, Harry Colebourn brought the bear to London. Eventually, when he could no longer keep it on military expeditions, it ended up in the London Zoo. There, the bear was a favorite of the real Christopher Robin who changed the name of his toy bear from Edward to Winnie. Colebourn’s great-granddaughter, Lindsay Mattick has written a children’s book about it, Finding Winnie. The film Goodbye Christopher Robin is based on the life of Milne’s family and son while the author lived in this house. Watch it on Amazon Prime. To see the houses featured in this blog, click on the matching numbers on the map below. John. The house was finished in 1914 and he lived there with his second (common law) wife and their children. John painted some of the most recognizable portraits of literary and artistic celebrities between the wars – notably Lawrence of Arabia, Dylan Thomas and several portraits of W.B. Yeats. He was also a notorious libertine with parties at the house said to end in orgies. He had at least 10 children by five different women. Eventually John tired of this house, calling it a “damned Dutch shanty”, and sold it to British entertainer Gracie Fields. Continue left down Mallord Street, turning left onto The Vale and left again onto The King’s Road. Across the street, you’ll find Paulton’s Square. Turn right into the square. Samuel Beckett lived here while having psychoanalysis nearby. 3.Irish playwright Samuel Beckett, usually associated with Dublin or Paris, underwent several months of psychoanalysis in London in 1934. A friend found him lodgings with a married couple at 48 Paulton’s Square. He was a regular at two local pubs, the Six Bells and The World’s End. While here, he published a collection of short stories, More Pricks than Kicks. Just in case you think you might like to drink where Beckett drank, you are probably about 40 years too late. The Six Bells, at 197 Kings Road, went through several incarnations before becoming The Ivy Chelsea Garden – which bears no resemblance to any pub Beckett might have frequented – though you might pick up his vibe in the beer garden if you can get in to this very popular, Made in Chelsea kind of place. The World’s End Pub, which was a real traditional boozer from the days of Charles II to about 10 years ago, is now an upmarket restaurant with a pretend 1930s ambiance. It’s now called the World’s End Market. Continue to the end of Paultons Square, walking toward the Thames. At the bottom of the square, turn right, then left into Danvers Street. 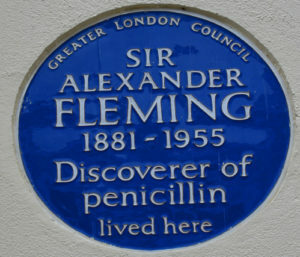 Fleming discovered penicillan while living here. the whole direction of modern medicine with the discovery of penicillin. From his first discovery in 1922, through refinements and clinical trials to his Nobel Prize in 1945 and until his death in 1955, he lived in this flat. In later years, he also had a country house in Suffolk. Now, continue to the end of Danvers Street to Cheyne Walk, beside the Thames. Turn right and continue in that direction. Cross at the set of lights at Beaufort Street – Battersea Bridge is on your left. Just past this intersection, you’ll see large cast iron gates, with a garden and a big yellow house beyond. 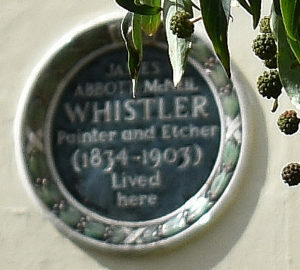 Whistler’s mother might have lived with him here. 5. and 6. You’ll need X-ray vision to see the plaque that is alleged to be at 98 Cheyne Walk. It’s behind a high brick wall. But just so you know, this was the home of Sir Marc Isambard Brunel who built the first tunnel under the Thames, the world’s first underwater tunnel through soft ground. He started it in 1825 and it wasn’t finished until 1843. While living here, he also worked on the education of his young son, who became the much more illustrious 19th century engineer Isambard Kingdom Brunel – designer of the Great Western Railway, the Clifton Suspension Bridge over the Avon Gorge at Bristol and the giant screw propeller, sail-assisted steamship, the SS Great Britain which you can still visit in Bristol. 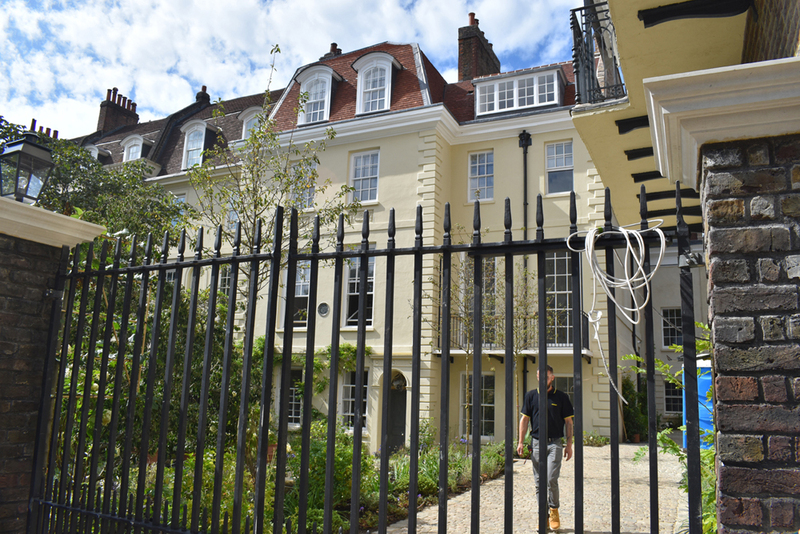 The lovely yellow house next door at 96 Cheyne Walk belonged to James Abbott McNeill Whistler and his mother – you’ve no doubt seen her in his painting, Arrangement in Grey and Black No.1, usually known as Whistler’s Mother. Whistler and his mother lived here. Bring along a pair of binoculars if you really want to see this plaque. It’s not blue and it’s at least 50 feet from the street, set back behind gates. Judging from the yellow house, you might think Whistler was probably pretty affluent when he lived there. But actually the house is just one quarter of a larger house built in 1674 by the Earl of Lindsey on land that was once Sir Thomas More’s garden. It was divided into four units about 100 years later and among the other rental tenants of this large villa were the Brunels mentioned above. Now turn and retrace your steps past Danvers Street. Continue along Cheyne Walk, looking out for the statue of Sir Thomas More, at the site of his house, in a small park beside Chelsea Old Church on your left. At Oakley Street, opposite the Albert Bridge, turn left. Oscar Wilde’s flamboyant mother lived here. came to London from Dublin after the death of her husband, Sir William Wilde. 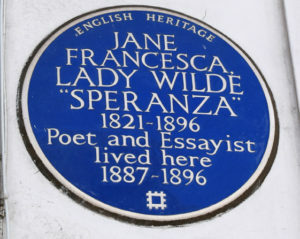 As a poet and essayist in Dublin, she wrote under the pseudonym “Speranza” and supported the cause of an armed Irish rebellion against Britain – which got her in no end of trouble. In London, she continued writing for fashionable magazines and eked out a slim livelihood. But she died penniless in 1896 while her son Oscar was imprisoned in Reading Gaol. Oscar paid for her funeral but there was no money for a headstone until the Oscar Wilde Society erected one more than 100 years later. Cross the street and head back toward the river to number 56. 8. 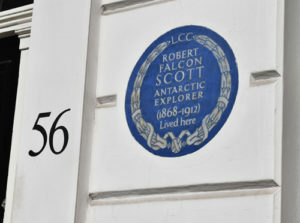 Doomed antarctic explorer, Robert Falcon Scott left for his last polar expedition from 56 Oakley Street and never returned. Scott identified the polar plateau, on which the South Pole is located, on a previous expedition, the Discovery expedition. But it was the second expedition, The Terra Nova Expedition, between 1910 and 1913, when all were lost. He moved to this house in 1905, on the return from his first expedition, and he wrote his famous account of that journey, The Voyage of the Discovery, while living here. In the late 20th century, his reputation took something of a blow with some historians saying his incompetence and lack of preparation led to his death and that of his entire team. But recent discoveries about the weather have restored his reputation as a doomed hero. Continue down to the river and turn left on Cheyne Walk. 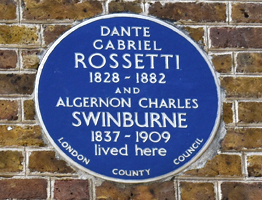 Rossetti and Swinburne shared this house as landlord and tenant. the death of his young wife and model in 1862. Some of his finest paintings, including Beata Beatrix, were done here and he published his collected works of poetry while living in this house. The decadent poet and sometime hysteric Algernon Charles Swinburne rented a room from him for about a year. Novelist George Eliot lived here for just weeks before she died. 10. 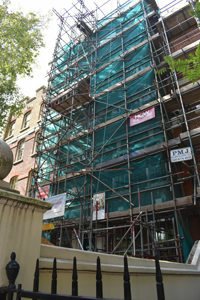 The entire facade, including the blue plaque at 4 Cheyne Walk was covered with scaffolding for refurbishments when we visited. But we’ve been reliably told that this was the brief last home of novelist George Eliot. She moved in with her new husband (20 years her junior – good for her) on December 3, 1880. Shortly after, she caught a sore throat and by December 22, she was dead. Now, bear slightly left into Royal Hospital Road, turning right at the corner of Tite Street. Oscar Wilde played at happy families for a while here. writing The Picture of Dorian Gray, Lady Windermere’s Fan and The Importance of Being Earnest. Now retrace your steps, cross Royal Hospital Road and continue along Tite Street to the corner of Tedworth Square. Mark Twain lived a quiet life in Chelsea. 12. 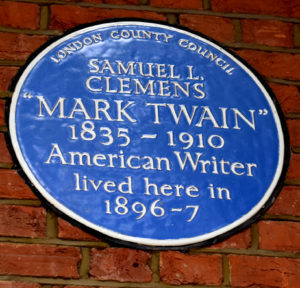 Samuel Clemens, who wrote as Mark Twain, took his lecture tour on the road in Europe between 1891 and 1900. During that time, his base was 23 Tedworth Square. After the death of his daughter Susy in 1896, the creator of The Adventures of Tom Sawyer, The Adventures of Huckleberry Finn, The Prince and the Pauper, The Innocents Abroad, A Connecticut Yankee in King Arthur’s Court and many more classic works, maintained virtual seclusion, with the rest of his family, in this house. Next, continue right, past Mark Twain’s house, to Ralston Street. Turn left on Ralston Street, then right on St Leonard’s Terrace. 13. How fitting that number 13 on this Chelsea Blue Plaque walk was the birthplace of one of the most terrifying creatures in literature. 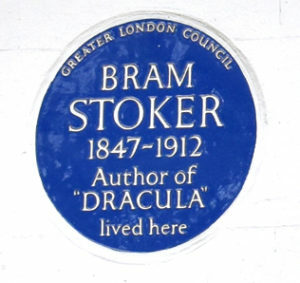 Dublin writer Bram Stoker was living in a pretty Chelsea cottage at 18 St Leonard’s Terrace when he wrote his classic gothic horror novel Dracula. Stoker had come to London to manage the Lyceum Theater for actor manager Henry Irving. Just beyond Stoker’s house, turn left on Royal Avenue and continue to the King’s Road. Turn left onto the King’s Road to Smith Street and look for the Blue Plaque near the corner. 14.Mary Travers, author of the Mary Poppins books, lived and worked at this smart Chelsea town house, 50 Smith Street, while she was writing the fourth book in the series. It’s also where she was living while negotiating the film rights for the musical film of her story with Walt Disney. Now that you’ve completed the walk, it’s time for some refreshment and what would be more fitting than to have lunch or a snack at another listed building with a blue plaque. Cross the King’s Road and turn left again. Look for an arched entryway, protected by two bronze birds of prey. 15.152 Kings Road, The Pheasantry, was the studio of ballet dancer and teacher Princess Seraphine Astafieva. The Russian princess, daughter of Prince Alexander Astafiev, came to England as a dancer with Diaghilev’s Ballet Russe in 1910. She retired from the stage to teach and in 1916 established her school, the Anglo-Russian Ballet, here. Most of the leading lights of early 20th century ballet visited her or took classes here, among them Margot Fonteyne; Alicia Markova, one of the founders of the Festival Ballet which became the English National Ballet; Anna Pavlova and Marie Rambert, founder of the Ballet Rambert. And in case you are wondering about the lunch or snack I mentioned earlier, these days The Pheasantry is also a Pizza Express. 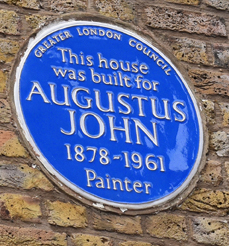 English Heritage who now administer the scheme, publish the Guide to London’s Blue Plaques. It lists 800 blue plaque locations, all over the city that can form the basis of many an enjoyable London walk. It’s availableonline from English Heritage or from Amazon.